(Bloomberg Opinion) -- Saudi Arabia on Monday began offering $10 billion of bonds of Saudi Aramco, the world’s largest oil company. Most of the focus was on how investors submitted orders for about $60 billion of bonds. Even if you are (rightly) skeptical of “order books” and think the true demand was for half that amount, it’s still a remarkable development for a country that just a few months ago was being ostracized for its role in the killing of Washington Post columnist Jamal Khashoggi. But there’s more to the story. 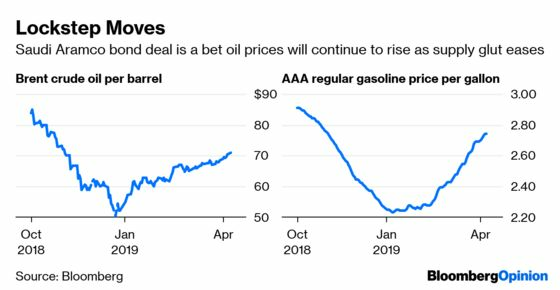 Perhaps it was the potential negative effect of rising oil prices on the global economy that prompted bond investors to step up at the U.S. Treasury Department’s auction of super-safe bills on Monday. The offering of $42 billion of three-month bills attracted bids for 3.07 times the amount offered, the most since January. 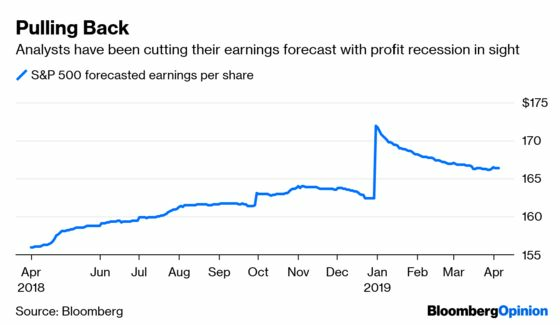 The offering of $36 billion in six-month bills generated a so-called bid-to-cover ratio of 3.14, the highest since February. Relatively high-yielding cash equivalents such as Treasury bills should see demand in an uncertain economic environment like the one the U.S. currently faces. 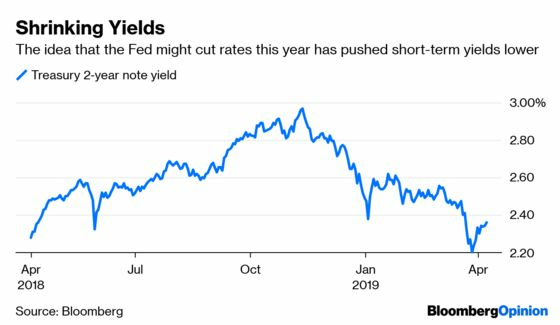 Plus, the market is pricing in about a 100 percent chance that the Federal Reserve will cut interest rates by 25 basis points this year. 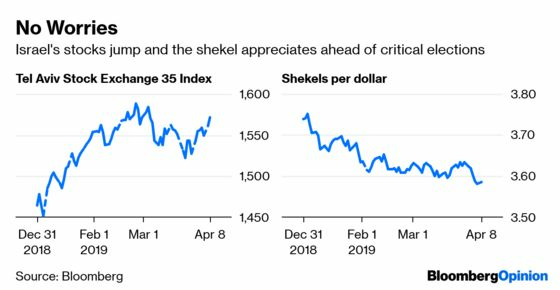 Regardless, this is a big week for the world’s most important market. Besides the regular bill auctions, the Treasury Department will offer $78 billion in three-, 10- and 30-year notes and bonds. In addition, the government on Wednesday will release the monthly Consumer Price Index report for March — which is forecast to show faster inflation, in part because of rising oil and gas prices — and the Fed will release the minutes of its March monetary policy meeting the same day. “For the market to begin pricing in a hike, we will need to see persistent inflation pressures,” said Noelle Corum, a portfolio manager in the fixed-income group at Invesco Advisers Inc., according to Bloomberg News. Time was when President Donald Trump could rattle the peso with a tweet or an off-the-cuff remark criticizing Mexico over trade or its handling of immigrants passing through that country on their way to the U.S.’s southern border. No more. 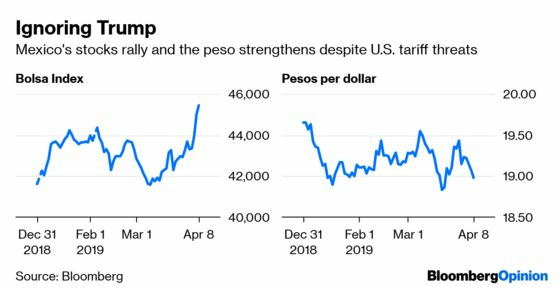 The peso gained on Monday despite broader weakness in emerging-market currencies and threats by Trump over the weekend to close the border with its southern neighbor “and/or” tariffs. The peso appreciated as much as 0.84 percent on Monday, strengthening below 19 a dollar in its fourth intraday gain and becoming the biggest driver of the Bloomberg Dollar Spot Index’s decline. The moves suggest that traders are starting to ignore Trump’s repeated threats against Mexico, having seemingly made contradictory remarks about potential tariffs of 25 percent on Mexican–made cars and a border closing. As Bloomberg News’s Sebastian Boyd points out, a lot of U.S. car companies such as Ford, Chysler and General Motors use factories in Mexico, and any tariffs like the one Trump has threatened could harm the U.S. economy. Plus, Mexican auto-parts suppliers such as Metalsa, which makes the chassis for the Chevy Colorado, Chrysler Ram and Ford F-150 pickup trucks, also have plants in the U.S. Tariff-induced pain could also cause them to cut back there, hurting jobs. Mexico’s stock market is also starting to hum, with the benchmark Bolsa IPC rising on Monday to its highest level since November.